Coal Feeder - Mechanical to Electronic Conversion | MERRICK Industries, Inc. 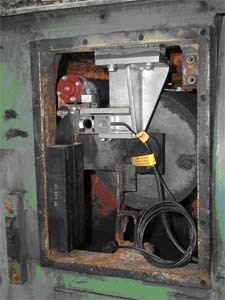 Many pre-1980’s feeders have a mechanical weigh system for determining the belt load. Related parts wear out in service, causing accuracy degradation. Also, such can be expensive to replace. Conversion to an electronic weigh system is economical and easy. The new system reduces maintenance costs and provides higher reliability and accuracy. Removal of mechanical weighbridge assembly. A high resolution belt speed encoder. Installing Merrick’s state of the art MC3 controller to control the feeder, calculate the feet rate, and provide process data back to the control room. State of the art Merrick MC3 controller. Some of the many benefits include its user-interface and graphical LCD touch-screen display making the MC3 the easiest to learn and use. Also, the MC3 has unparalleled connectivity to most any modern industrial network protocals. With dual load cells, the MC3 controller monitors the performance of each load cell independently and converts to volumetric automatically when needed.